I always love to see what inspires people to create the items of their craft. I thought I would share a couple of mine with you today. First is the latest jackalope feltidermy. 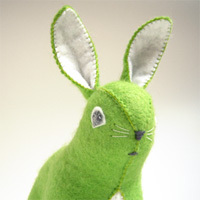 Jackalope 23 Feltidermys’ inspiration came from one of ArgyleWhales‘ sweet bunnies, Yoshimi. 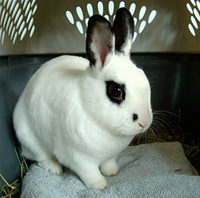 Isn’t she one of the cutest bunnies ever? I just love her black ears and the rings around her eyes! Of course I had to make her a jackalope in girlsavage style. Before that I was inspired by Xanadu on Broadway to make a Pegasus! My husband did the revamp on the website, then we went to go see the show. After seeing the pegasus in the show, I just had to come home and make one! 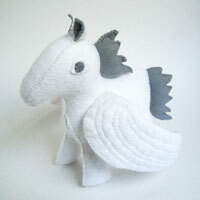 You can find the Pegasus plush here in my shop. What inspires you to create? Thanks for stopping by! I hope you are inspired to go create something new! Where did June go? It seemed to fly by before I could catch up with it. Hopefully, July will go a little slower. I finished a custom piece Loch Ness Feltidermy yesterday. I love the way his neck turns just enough to make him look curious. I also finished this little guy yesterday, a baby chipmunk. He is for my nephew, who I don’t think reads my blog. And if he does… well happy birthday, he’ll be shipped out today! 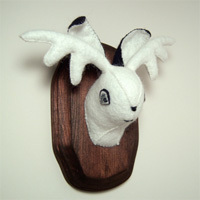 I have a jackalope plush to finish today. I’ll show you it tomorrow. Have a great day and thanks for stopping by! We went to the drive-in last night to see the new Indiana Jones movie! I had heard bad reviews for it, so we were a bit worried that it would be awful. I have to say that it was exactly what an Indiana Jones movie should be, fun! 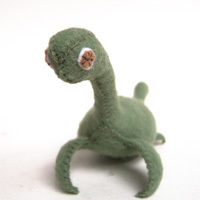 There is a new creature in the shop this week of mythical proportions. Pegasus Wool Felt Plush I’ve been waiting for the chance to make this guy for a few months. I’m very happy with the way he turned out. Also new this week is a brand new feltidermy! Loch Ness Monster Feltidermy I really like this one, I get a giggle every time I look at it. Thanks for stopping by, I hope you all have a lovely weekend! A few new faces and some excitement. A few new faces made it into the shop this week. Cinder the Wool Felt Little Lamb made his 1st appearance on Monday. He reminds me of a baby lamb that used to follow me around the farm when I was little. Yes, I had a little lamb and no his fleece was not white as snow, but he was very sweet! Yes that’s me at 2 with my little lamb, out in front of the house. There were also a couple new Feltidermy added this week. A couple new plush were also added, they are already on their way to their new home. And now for the excitement! Christine and Danielle of Fact&Fancy have invited me to be a part of their 1st show! I sent off a few pieces to be a part of the show! The Wet Paint show will be open from June 1st- July 13th at 75B Hoyt St Brooklyn, NY 11201 Please check it out if you can, I sure would like to get down to see it! It’s the 1st show I’ve participated in, so I’m very excited about it! I hope you all enjoy the rest of your weekend! Thanks for stopping by! This is Chocolate Chip Jackalope, the newest little bitty guy at girlsavage. He is Ferns’ little brother. 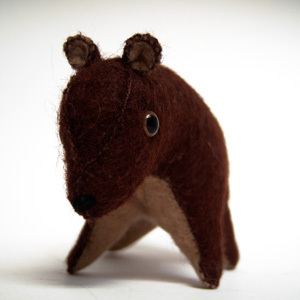 He will be added to my shop this afternoon! We are having a rainy morning here. Have a great day!